I have had a wonderful day watching Louise baking and creating the most wonderful food. Macadamia nut cookies, Chocolate chip and macadamia nut cookies - wow to die for!! Then we had fried green tomatoes and grits for lunch - another taste sensation!! I have so enjoyed tasting things I have heard/read about but never tasted!! 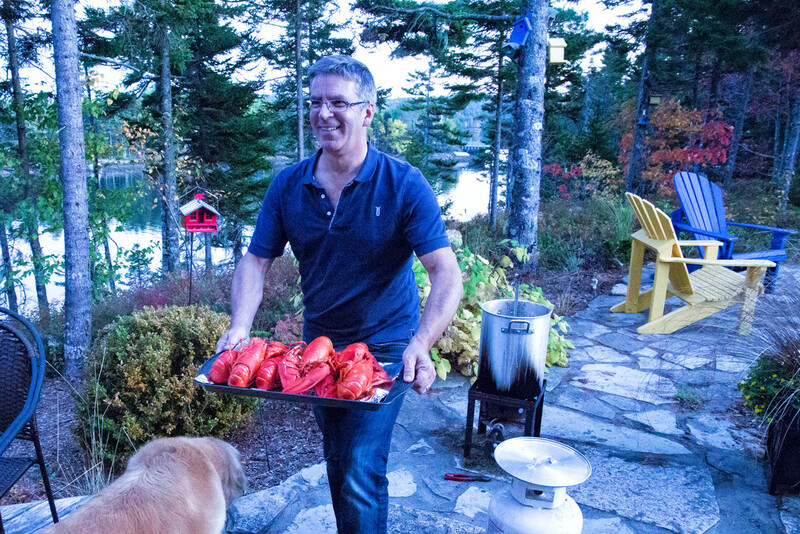 The day finished with a lobster dinner cooked at Louise and Ken's friend Mike's house. I had never had hot lobster dripping in melted butter before and I finally understand why lobster is so loved!! What a fabulous evening in a stunning setting. The perfect end to my Nova Scotia adventure!! Gorgeous setting for a wonderful dinner! OMG, to die for. Fried green tomatoes (Southern) AND lobsters dripping with butter (Northern). What a hospitality potpourri! @rosiekerr She really ought to stick around (emphasis on "'round") and go shopping for new clothes with me! It really was a wonderful day, Pam! For some reason I thought I was posting before you, but how funny that we write such similar captions with a focus on identical things! This really was the crowning glory to a wonderful visit; you've been an amazing guest! I couldn't be happier that you're returning home with so many wonderful memories and bazillion wonderful photos! So sad to read your trip is at an end. It really has been quite an adventure! That menu from today alone would be worth the trip! Sounds delicious. It also seems like you had a fabulous time visiting with Louise and Ken. It looks idyllic! You won't want to come home! Sounds like you are having a wonderful time. I live in Maine and hardly ever eat lobster as it just doesn't do anything for me. I love clams and mussels better. Oh YUM! This sounds like a feast. I wish I was there. Wonderful food and a wonderful holiday!